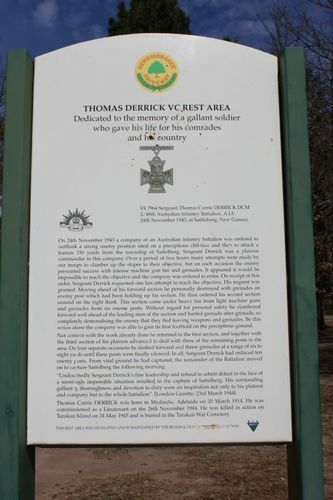 A rest area commemorates Sergeant Thomas Currie Derrick who was awarded the Victoria Cross (V.C.) during World War Two. 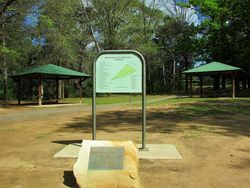 A grove of Poplars, Gums, Oaks and Ashes were planted astride Towrang Creek as part of the Remembrance Driveway at the old bridge site by the Goulburn Garden Club in 1954. The Derrick V.C Rest Area was established in 1999. When Tom `Diver` Derrick appeared on the front cover of the Australian Women`s Weekly in May 1944, he became a national hero. His Victoria Cross, the fourth to be awarded during the Pacific War, was awarded at Sattelberg in New Guinea. Sergeant Thomas Derrick`s battalion, the 2/48th, was attacking Japanese positions on the heights of Sattelberg, near Finschhafen on 24 November 1943. The Japanese had dug in and were vigorously defending their position when Derrick`s platoon was ordered to withdraw for the night. Derrick refused to give in and, instead, set off alone up the cliff face towards the Japanese positions with a haversack of grenades. Despite their gunfire, he was able to hurl grenades into eight Japanese positions and reach the summit of the hill. Next morning, when the Australians advanced, they discovered the Japanese had gone. Thomas Derrick was killed in Borneo eighteen months later. 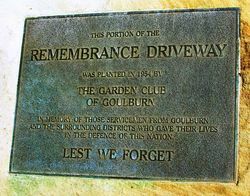 In Memory Of Those Servicemen From Goulburn And Surrounding Districts Who Gave Their Lives In The Defence Of This Nation.